apparently our family history has a tale that Octavius Atkinson & Sons got the contract for dismantling & shipping Cook’s Cottage to Oz. My great uncle Reggie was a young clerk on the job. Anyway, one day the wages disappeared and so did my uncle Reggie. Legend has it that Reggie went on to fight in Palestine, tried his hand at smuggling cigarettes across the Med in speedboats and various other things. He eventually ended up living in Gothenberg, where I presume he still is. I believe Gary’s family anecdote has somewhat confused what actually happened here! I too am related to this Atkinson family. Reginald Octavius Atkinson was involved in the Cooks cottage relocation & was father of Reginald Bateman Atkinson who went first to Palestine, later to Sweden. The latter is indeed still there!!!! 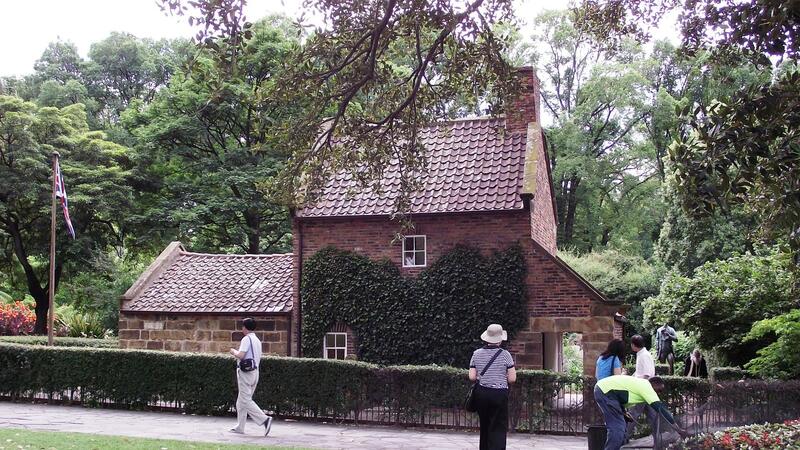 It was my father who was responsible for and planned the movement off Cooks cottage to Australia. I have some of the documents, plans and photos´ off the project. He was given the responsibility in order to give him a chance to earn his place in the family Company ” Octavius Atkinson & son`s”. Unfortunately he did not succeed. His problem was gambling and the high life. He disappeared for many years. I found him, Old and demented many years later. I was brought up to believe that he lost his life at Dunkirk. In some way my own life and adventures have been mixed into the story. The family Atkinson story is not at an end. I am 85 years old, still going strong, the father off 5 boys and 2 girls, 13 grandchildren and one greatgrandchild. All doing very well. Not bad for the son of a family blacksheep. My maiden name was Janice Constance Atkinson. I am the daughter of Reginald Octavius Atkinson. My mothers name was Dora Ypres Yates, I was born on 25th August 1940. I have recently learned some of the history of the Atkinson family and despite the knowledge that my father was a ‘black sheep’ as it were, am delighted to now understand about the family. My father left my mother when I was two years old but reappeared from time to time. He spent some time serving in the Royal Engineers during the WW11. I would also appreciate any further information regarding my father from 1951 to 1958. I’m delighted to know that I do have relatives. Hello all, i’m Phillip Atkinson, grandson of Reginald Octavius Atkinson. My dad and aunt are 2 children born to him in the 50’s. It’s quite a touchy subject in my family and always has been, i’ve just always wanted to know who my grandfather actually was. Every 6 months i’m finding something new and it’s really important to me that i find out about my family history. Any information or contact with any of you would be fantastic. I am 22 years old and currently live with my family in oxford.